Does this game have any kind of open game license? Well, I've tried to follow what's available in the expanded Preview. I've got years of tabletop experience and that may be detrimental to my understanding because I can't see myself trying/buying this game without an experienced guide leading me by the hand. This "Standard Distribution" curve is gibberish to me in terms of using it in this game. The example of character creation with "Bob" quickly launches me to utter bafflement. We have an insuperable Catch-22 here. I suspect my only chance to understand this system is to read the entire book, but I ain't gonna buy the book because there is a chance it is too convoluted an exercise in obtuse statistical analysis for me to understand. As a sidenote, I see a few comments and reviews unhappy with lack of artwork. Take some minor comfort that is not an issue with me, since 96% of game system artwork isn't worth blowing my nose on. A legible layout and design is all that is required. Aloha, I am a long time GM and I have ran this system with over 50 players on the big island for the last 10 months. From veteran players to people new to RPGs and all between this game has been enjoyed. I have to agree the alpha book does require reading and practicing to fully grasp it. But in this system you can play with only 1 stat (Quality) or any of the cascades so it makes it very easy to run, teach, and enjoy for all varieties of gamers. I wish the starter book had more art, but the system has many good ideas and is very flexible. If anyone of you that have tried to run the system and had a hard time and are willing to try it again let me know and I will set a game up and show you how I run it. Being able to discuss the system with someone would help a lot if you wouldn't mind. If you're like me, when you play an RPG ruleset, as the GM you invariably are altering the rules to make the play feel more realistic. As the player, you're also thinking about ways to work around the rules to do try a unique problem-solving approach. Everyverse is designed to solve both those problems. To be sure, with flexibility comes complexity but the premise is you adopt what works for you, ignore what doesn't, and the game system still holds together. There are some very unique game rule structures it explores and it definitely takes the generic roleplaying paradigm to the next level. Whats the difference between a B&W and a Color book? If there's no art inside, then they're all B&W right? The character and planetary sheets are in color. I have never seen a game that features adjustments for your character's age, workout regime, and job history, but can't be bothered to tell you how many skill points a new character can start with. It also has the most convoluted way of resolving actions I've ever seen. They point out many times that you can simply ignore certain parts of the system, technically true of any game, but I didn't pay $30 for a thin hardcover book to ignore much of it's contents. We've all thought that we could make a good RPG system if we actually sat down and tried, and I salute these guys for actually doing it, but this is a swing and a miss. It's a system that focuses on all the wrong things. A character can start with as many skill points as you would like. If your character is 18 years old, how much do they know versus a character who has been around the block and engaged in some work for a number of terms? The system is built for flexibility and rules can be ignored, if you would like to, so you can focus on the scenario. We are only offering the option, not telling the GM to do so. The basic way of resolving actions is to roll 4d10, look that value up in a table which gives you a score between 70-139. If that score is less than or equal to your applicable attribute or skill score, you succeed. If not, you fail the attempt. I think maybe there might be a few games out there that don't account for adjustments for job history. But I'm drawing blanks. I know Deadlands, DnD, Pathfinder, Shadowrun, Warhammer RPG, Firefly RPG, TWERPS, BattlestarRPG, StarTrek RPG, etc all have attribute adjustments for job history in some way. Moreover, the age pool and skill point options are variants -- I know that most RPG GM sourcebooks list variant options. But I think the book needs to have some more clarity about starting skill points as they do affect mechanics. Correction -- a character starts with skill points earned thanks to the number of terms in a profession. Professional terms are 4 years, 3 skill points per year or 12 skill points per term. Make sure to read the review first. This game book has no art, no design work inside, the cover can be misleading... I regret purchasing this product, it is not clear! within the game text how this game works. You should almost instantly be able to tell how the game works at a glance of the text. Bad design = bad product = wasted money (frustrated emoji goes here). The game is built for flexibility. You can use all of the rules or streamline it for more focus on the scenario. 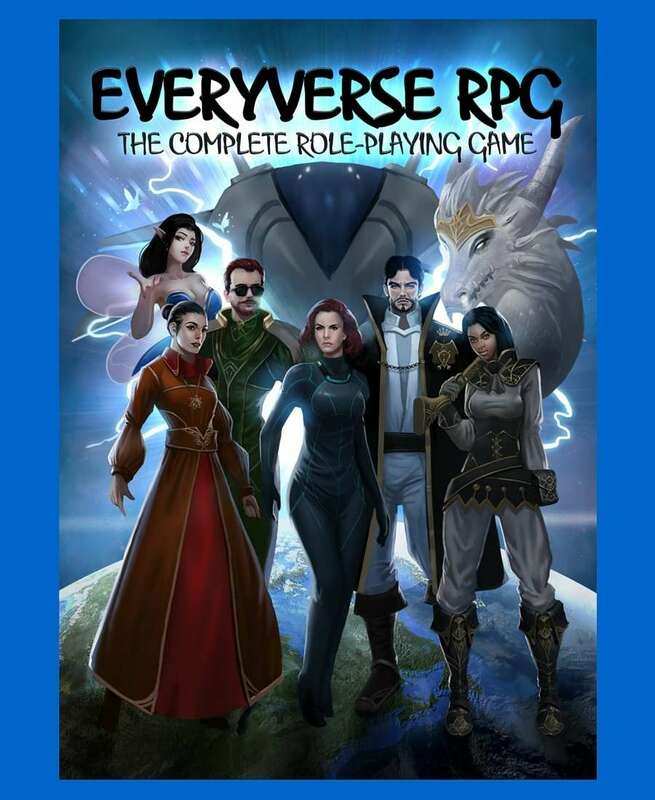 Here is what Wen Spencer, noted science fiction and fantasy author said about it: "Eververse allows for a free range of game play where characters are limited only by the players’ imagination. Easy to learn. A blast to play. I’ve never felt so free to be as creative in a game before." If I have to design my own game rules - I will do that, for myself. It may be "easy to learn, a blast to play" but nothing in the art or type arouses my curiosity to get that far. This is just my opinion, my former comment stands as-before. Thanks for the reply. It looks interesting. Unfortunately, when I use an RPG PDF, I frequently copy and paste text into my notes and/or character sheets. A product with "copy/paste disabled" is crippled to the point where it is to much of a hassle for me to use. Please uncripple your product and I will likely buy it. I uncrippled it today. Thanks! Thanks! Putting on my to-buy list! A 6-page full preview that has two pages effectively blank does not inspire confidence! I increased the preview to 20 pages today.